Storleik på førehandsvising: 800 × 552 pikslar. Andre oppløysingar: 320 × 221 pikslar | 640 × 442 pikslar | 1 000 × 690 pikslar. Ground-penetrating radar depth section (profile) collected on an historic cemetery in Alabama, USA. Yellow arrows indicate very distinct reflections, probably associated with human burials. "hyperbolic" reflections, appearing as an inverted U, are typically associated with discrete objects. Less distinct hyperbolic reflections are indicated by red arrows. dashed blue lines indicate horizontal and sloping reflectors, probably bedrock. The many smaller reflections near the surface are likely to be caused by tree roots. 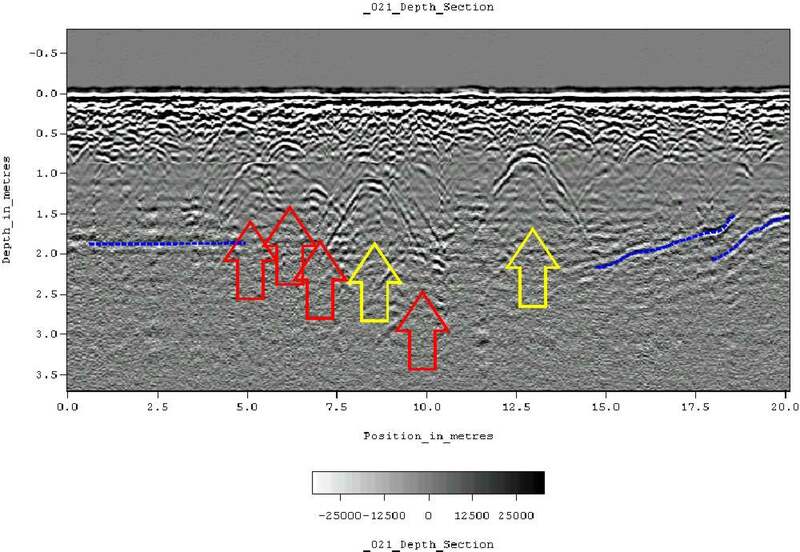 Because of the nature of the site, subsurface testing was not conducted, but these interpretations are supported by surface indications (grave markers and depressions) and with line-to-line patterning within the GPR data. Kjelde Transferred from en.wikipedia to Commons. Dette verket er vorte frigjeve til ålmenta av opphavspersonen, Tapatio at engelsk Wikipedia. Dette gjeld over heile verda.